Good morning, folks. Erica Butler here at the Morningfile keyboard today. Both staff and prisoners say that the change to new day rooms has been disorganized, that there is little in place to support the move, and that a number of promises to both staff and prisoners have not been fulfilled. These conditions led to a labour action where staff, unable to hear their radios, refused to work in the new dayrooms. As a result of the problem with staffing, the prisoners have been locked in for 23 hours a day since at least the weekend. Premier Stephen McNeil and minister of lands and forestry Iain Rankin won’t weigh in on the recommendations of the Lahey Nova Scotia Forest Practices Report released on Tuesday, reports Jennifer Henderson for the Halifax Examiner. McNeil also declined to share anything further about the province’s Boat Harbour cleanup negotiations with Northern Pulp, or any details regarding Nova Scotia’s proposed cap and trade policy, which is meant to be filed with the federal government on September 1. Click here to read Jennifer Henderson’s “Mum’s the word“. It’s fair to say the coalition may be feeling the pressure, as earlier this week Montreal’s city council unanimously passed a motion “calling on the federal government to impose a nationwide ban on the possession of handguns and assault weapons,” as reported by Sabrina Marandola from CBC News. ​The spiritual leader of one of the largest Buddhist organizations in the Western world is denying new allegations of sexual misconduct and financial coercion, saying his apology to the Shambhala International community should not be misinterpreted as a validation of the accusations against him. The new allegations come in the form of another report from Project Sunshine, and draw a picture of a system of exploitation of students involving not just the Sakyong but those close to him. Since Project Sunshine first started publishing alleged accounts of sexual misconduct, Shambala’s leadership council has resigned en masse, and the Sakyong has stepped down pending an investigation into the allegations conducted by Halifax law firm Wickwire Holm. Project Sunshine’s latest report points out that there is some mistrust of the independence of the investigation, as it’s not clear who hired Wickwire Holm, and to whom the law firm will report findings. 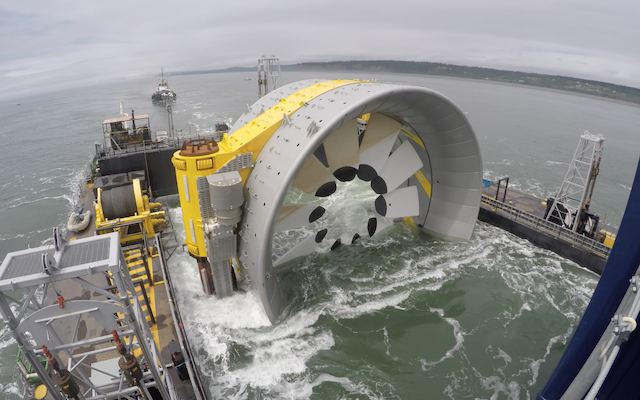 It’s been a month since OpenHydro and Emera deposited a massive five-storey, 1,000-tonne tidal turbine at the bottom of the Bay of Fundy. Nova Scotia Energy Minister Derek Mombourqeuette says he continues to ask those companies to find a way to monitor the impact on marine life in the immediate vicinity of the device spinning above the ocean floor. Nova Scotia is the regulator responsible for a device that cost more than $30 million to build, whose ownership is up-in-the-air, and could become a liability as a navigational hazard, a potential destroyer of fish habitat, and a financial drain if the government has to pay several hundred thousand dollars to remove the turbine. The joint venture known as Cape Sharp Tidal imploded four days after the turbine was deployed. Naval Energies, the French parent company of Dublin-based OpenHydro, pulled the plug on its $381-million investment. Minority partner Emera is walking away after losing well over $12 million. But the story is far from over for taxpayers in Nova Scotia. Nova Scotia is responsible for ensuring the device doesn’t harm the environment. The turbines’ blades continue to spin — putting fish and marine mammals at risk — while the turbine owners have failed to live up their obligations under approvals granted by the Nova Scotia Department of Environment and the federal Department of Fisheries and Oceans. The turbine has been in violation of its approvals for three weeks, but handing out fines to a bankrupt company is absurd. The turbine is not producing electricity .The sensors and equipment built into it are not operating to monitor the interaction between the blades and the fish and marine mammals within 100 meters. There appears to be no environmental monitoring going on in the immediate area of the turbine although the Fundy Ocean Research Centre for Energy (FORCE) set-up by the province continues to carry out monitoring for the larger area of the demonstration site in the Minas Passage. FORCE has stated it’s the responsibility of Cape Sharp Tidal to carry out monitoring in the near vicinity of the turbine even though a letter to FORCE from the Nova Scotia Department of Environment last March states FORCE has the overall responsibility to ensure Cape Sharp lives up to the terms of the approvals. That was underlined after Thursday’s discussion with reporters in an email from Energy communciations spokesperson JoAnne Alberstat. Last week, FORCE referred questions to Cape Tidal about contingency monitoring and the deployment of an unmanned platform taxpayers paid to develop if sensors on the turbine didn’t work, which is in fact today’s situation. Cape Sharp’s Nova Scotia partner, Emera, ducked the question and passed the buck to Grant Thornton, the liquidator appointed by the Irish High Court to dissolve the company’s assets. Grant Thornton is standing down while a group of employees and minority shareholders in OpenHydro make a last-ditch plea to the court to find new investors and re-structure the hemorrhaging company. A hearing will be held in Ireland September 5, after which date Energy minister Derek Mombourquette says he will be in a better position to assess what Nova Scotia’s options are with respect to regulating an orphaned sea-bed installation with the potential to impact marine traffic (boats) or marine life such as fish and mammals. Mombourquette says the province has “no interest” in bidding to buy the turbine should it eventually come up for auction. He says until the court sorts out OpenHydro’s future, the province is unable to access or reveal the size of a surety bond posted by the joint venture that could help pay to clean up the mess. “Ms Justice Miriam O’Regan on Friday appointed insolvency practitioner Ken Fennell as interim examiner to Dublin-based OpenHydro Group Ltd and its subsidiary Open Hydro Technologies Ltd after being informed that an independent experts’ report had shown the companies had a reasonable prospect of survival if certain steps were taken. €280 million is CN$424 million. Earlier this year, Neeta Kumar-Britten’s 18-year-old son was diagnosed with bipolar disorder, which combines episodes of depression with mania. After the diagnosis, because he is under 19, he was sent to the Garron Centre for Child and Adolescent Mental Health, a 14-bed in-patient unit at the IWK Health Centre. In a sort of bureaucratic Catch-22, while the 18-year-old is too young to qualify for adult care in his own Cape Breton community, he is legally old enough to refuse permission for the IWK to share information with his parents. And so Kumar-Britten is now concerned her son is on his own in Halifax, possibly undergoing a manic phase. It’s looking like a sunny and warm Saturday is in store, but be careful where you plan to swim. Yesterday, Halifax announced closures at two more beaches, reports Graeme Benjamin for Global News. Kinap Beach on Porter’s Lake and the Dingle Beach on the Northwest Arm were both closed to swimming Thursday. Two major Dartmouth lakes, Banook and MicMac, are under advisory for potentially toxic algae blooms. If you are looking to cool off on Saturday, check for water quality reports from the city or the Nova Scotia lifeguard service before you jump in. The former Liberal government of Paul Martin signed a $5-billion contract with Sikorsky to buy 28 Cyclones, which were supposed to begin arriving to the air base in Shearwater, N.S., in 2008. …Earlier this year, the air force said it had taken delivery of eight CH-148 Cyclones, with the rest slated to come by 2021. This item is written by Tim Bousquet. Yesterday, the Supreme Court published a written decision by Justice Joshua Arnold in the case Hebron Hospitality Group Inc. d/b/a Smiling Goat v. 778938 Ontario Ltd. d/b/a Starfish Properties. The decision was not a verdict — the claims and counterclaims have not been ruled upon — but rather a procedural decision about costs. Still, the decision is interesting. 78938 Ontario Ltd., doing business as Starfish Properties (“Starfish”), is a commercial landlord. Starfish owns commercial space at 1715 Barrington Street, Halifax. Hebron Hospitality Group Inc., doing business as the Smiling Goat, is a chain of coffee shops in Halifax. Hebron intended to rent the commercial space for a café. Jagpreet (Kit) Singh, is the President of Hebron. According to Mr. Singh’s affidavit, Hebron spent $284,000.00 in leasehold improvements at the space on Barrington Street. The parties agree that Hebron ran into difficulties making lease payments to Starfish while the leaseholds were under construction. According to Mr. Singh’s affidavit, an agreement was entered into on July 17, 2017, setting out a schedule of payments to bring Hebron’s account up to date. The agreement required Hebron to provide certified cheques in specific amounts on specific dates. Starfish says Hebron defaulted on the agreement and terminated the lease. Hebron denies defaulting and has brought an action against Starfish alleging wrongful termination of the lease, seeking damages in the amount of $284,000.00. Starfish has counterclaimed against Hebron, alleging rental arrears and loss of future rent, and seeks damages in the amount of $372,000.00. Service Employees International Union, Local 2, Brewery, General and Professional Workers’ Union, in the amount of $14,184.74, issued June 4, 2018. In support of its application, Starfish filed the affidavit of Jeff Waugh, which contains a number of paragraphs referring to media articles about problems with the Smiling Goat and Mr. Singh. These paragraphs were properly objected to by Hebron. Paragraphs 43-55 of the Waugh affidavit are struck as hearsay. However, Mr. Singh was cross-examined extensively during this hearing and admitted some of the facts referred to in the media stories. Mr. Singh’s testimony in this regard is admissible. Mr. Singh agreed that Hebron expanded too quickly and into locations that were not profitable. He testified that the company was stretched too thin financially. He says his financial strain was exacerbated significantly by Starfish when they claimed Hebron defaulted on the lease. He testified that spending $284,000.00 on leaseholds for a coffee shop that never opened inevitably led to serious financial issues for a small business. “Mr. Singh is reluctant to accede to the judicial process,” writes Arnold dryly, referring to Singh’s failure to pay the judgments against him and to even acknowledge that he was properly served. Having observed Mr. Singh testify, I believe that he strategically challenges bills from his creditors to delay the payment process and is not shy to avoid timely payment of legitimate debts. I would send that comment to anyone who in the future thinks it might be a good idea to do business with Singh. I order Hebron to pay security for costs to Starfish in installments. Hebron is ordered to pay $11,750.00 as the first installment by November 30, 2018, which should precede discoveries. Hebron is ordered to pay $11,750.00 for the second installment by April 25, 2019, which should be paid prior to requesting a Date Assignment Conference. 1. How about a monument to the Maroons? Every year, Citadel Hill receives hundreds of thousands of visitors, and one would imagine this National Historic Site and Halifax landmark, given the contributions the Maroons made to its construction, would have a very visible marker honouring Maroon history. But no such thing is there. The waterfront is another place that cries out for a monument to the Black experience. In the case of the Maroons, this was where they landed in July, 1796, and the site from which they left when they sailed to Sierra Leone in 1800. …It is high time that the Halifax municipality, the provincial government of Nova Scotia and historical, curatorial and academic bodies give visible recognition to the Maroons. “Remember that time a cow got loose from CPA and made it to Sackville?” posts Reddit user MinnieMazola, much to my delight, and yours too, I hope. It turns out that circa 1994, Charles P Allen High School students used to run an event called Cow Patty Bingo, where people essentially took bets on where a cow would first poop in a field marked with a Bingo card-style grid. And naturally, the cow got away. Someone has digitized the Live at 5 report on the incident for posterity. Be prepared for plenty of cow puns, and exasperated-looking RCMP officers. There is a disturbing lack of ships on the Georgian Bay. Here’s some fun Examiner trivia: Tim is under the impression that “going on vacation” is the same as “working slightly less.” But hey, if he calls it R&R, who am I to argue? The Halifax Waterfront has an increasing variety of monuments. So much so that it has in my opinion become a featured attraction for tourists to do a “monument walk” all the way from Pier 21 to Historic Properties. The addition of a monument to the Maroons is a no brainer. No need to study, discuss, analyze or deliberate. It is something long overdue and should be installed forthwith at a suitable location amongst the great selection of current monuments. Some other that should be considered as well include: the Black Loyalists; the Chesapeake Refugees (Black settlers who came after the War of 1812); The battle of HMCS Shannon and USS Chesapeake; the Mi’qmak; etc. Oh god, I made the mistake of watching the video. GAAAWWWDDDDD Nancy Reagan! I guess it’s a good reminder that Halifax needs more Halifax Examiner and less Live at 5. The “poo in the water” problem is worse than you describe. The test data that HRM puts on the website is always 4 days old. As of last year, this fact is now being hidden as test results posted online no longer have test dates included. Who wants to know they swam in unsafe water 4days after they did. So how does HRM deal with this? By making sure they have little to no responsibility for the beaches of course. Both Black Rock beach and the Dingle beach are examples of this. Both beaches have had lifeguards halted permanently based on the fact there was greatly reduced use of the beach. There was greatly reduced use of the the beach because it has been closed so often due to unsafe waters. It is my belief that HRM will stop posting test results altogether if possible. We never got any response regarding the fact that posted test data is always 4 days old other than that the testing was not done by HRM staff, and many of the bodies of water are Provincial (inferring it those are not HRM’s responsibility). What I would like to see, is no more kids playing in these waters if it isn’t safe. In order for this to happen, HRM will need to take some responsibility for public outdoor, natural swimming areas, and keep a human monitoring them or some other system to keep people out when swimming is not safe. A much bigger problem is why these waters are becoming unsafe to begin with. Is the sewer treatment working as well as it should be? Is it part of the cause anyway? How about Cruise ships and other large vessels with dedicated-to-the-sea grey water systems? Statues of Richard Preston and and Donald Marshall Jnr would remind everyone of two of the most important people in the history of Nova Scotia and who brought significant and long lasting change to the province. Underwater monitoring of the type described in the environmental monitoring plan filed by Cape Sharp Tidal is difficult and involved. Putting sensors in the water is one thing – configuration, testing, and deployment would take time and $$$. You might say “well put the sensors in the water and then at least we have the data”, but there’s no sensor that simply counts animal encounters with the turbine. Getting useful data requires shoreside processing of raw data. The raw data is large – almost 6 TB per day, per the EMP. That exceeds the usable FORCE bandwidth and will fill onsite storage in about 3 weeks. The raw data has to be processed and only the relevant portions or processes results stored. The entire plan is built around ongoing manual intervention in monitoring, which means people, which means “ongoing operational cost”. Which means the only option being seriously considered by the government, I assume, is extracting the turbine.